Earlier this weekend, I blogged about how I’m out of town for the weekend due to a friend’s wedding. In this previous blog post, I also mentioned that I’d make it a point to go visit Catholic churches whenever I’m traveling about by myself. 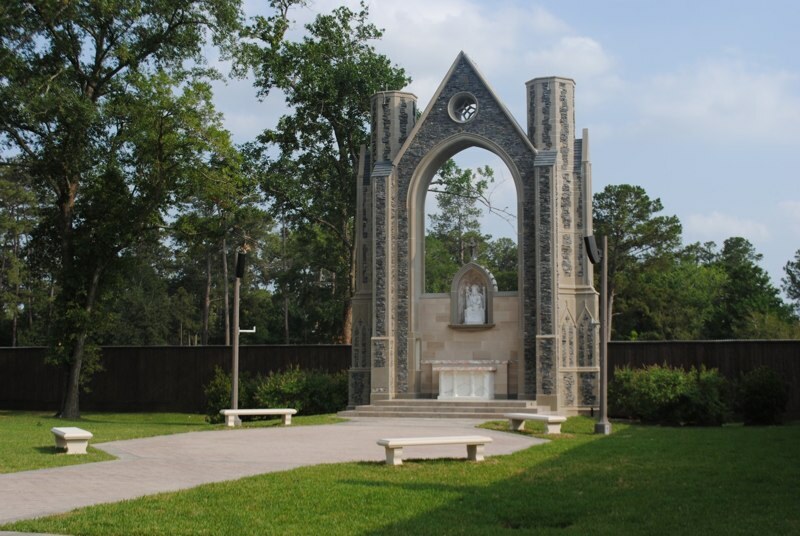 So, the main motivation behind this idea was to go visit Our Lady of Walsingham Catholic Church in Houston, TX. An old-but-new-friend now calls that parish his home–Father Chuck Hough IV. I had the pleasure of meeting Fr. Chuck a year ago when he landed a job in religious education at my home parish. I met him and his lovely family at a backyard party, haha. Fun facts: a) we both went to Texas A&M, b) my current spiritual director is his former spiritual director. Lastly, he grew up in the Anglican Church. He was ordained as an Anglican priest and after conversion and discernment, has been welcomed into the Catholic Church. He was recently ordained as a Catholic priest (see Bishop Vann’s blog on that here) and his Ordinary assigned him to Our Lady of Walsingham. Kind of big news in the Catholic world because in addition to him being ordained, his father, Chuck Hough III, was also ordained as a Catholic priest. Father and son. Catholic priests. A rarity, for sure! So, in my travel plans…it worked out best for me to fly in and out of Bush Intercontinental. And a few days ago, the idea popped in my head that I should go visit Fr. Chuck IV since I’d be in town anyway. Yeah, the church is out of the way coming from the east towards Houston, since it’s on the west side and the airport is on the north side. But …I figured…why the heaven, not? Haha. This morning, when I left my hotel at Orange, TX …I thought to myself, “Self, hey…I should try to see if I can sneak in a confession before the 10:30AM Mass at Our Lady of Walsingham…” So I check out and leave Orange, TX at 7:30AM. Two hour drive later, I’m at the church. I get there right as Mass ended. I awkwardly walk around trying to look like a parishioner and know what I’m doing, but I don’t know where I’m going…but I find the narthex of the church. And I see Fr. Chuck IV conversing with members of the parish. I awkwardly stand there until he notices me. And finally he does! Fightin’ Texas Aggie handshake (normal, but joyful and intense). Exchange of “how are you?s” After he wraps up conversing with other parishioners, he takes me on a tour of the church and grounds. Our Lady of Walsingham’s architecture replicates the style and format of 11th century churches in England. What that means exactly and how do I describe that, I’m not sure. It looks like a castle on the outside? The inside has huge pillars outlining the perimeter. The altar is right up against the tabernacle because Mass is celebrated ad orientem, or “to the east.” In other words, most of the times, the priest and deacons have their back to you. There is a choir loft. In other words, the choir is up on the balcony and you cannot see them. Organ is up there as well. One of the trancepts of the church is actually a chapel whereby the chapel is a replica of Mary’s house in Nazareth. Same dimensions. He showed me inside, and in addition to the tabernacle, he pointed out the statue of the image of Our Lady of Walsingham, which her most prominent feature is that she’s wearing a crown. The chapel connects outside and you can see the shrine, pictured below. It’s a replica of the real shrine in England. Cool. After showing me around, he tells me he’ll start hearing confessions after he takes like a …10-minute break. So I go back into the church and get in the confession line. I pray for a while. I actually was one person short of going to Confession because Fr. Chuck had to prepare for Mass, so I didn’t get to go. But he said he could resume Confession after Mass. Now, I’d like to describe the things that make this particular Anglican use Mass unique compared to what I’m normally used to at my own parish. I participated in the Solemn Mass at 10:30AM…so…I think that’s their equivalent of our High Mass. During the procession, altar servers carry the cross like normal, but are then followed by the choir, the rest of the altar servers, then the clergy. I thought it interesting that the choir would be part of the procession. In general, the liturgy uses an Anglican translation of the Latin Mass. These translations are older than the translation used after Vatican II. So, you can hear and say words familiar to us with the new translation. However, because the Anglican church originated in England, you’ll find more ye olde English in the missal. Ex. “And with thy spirit” instead of “And with your spirit.” So there’s definitely more thee’s, thy’s, etc. I’m not sure to what extent the new translation of the English Mass had on the liturgy in Anglican use churches. There were no Extraordinary Ministers of Holy Communion. Only the ordained ministered the Eucharist. The Eucharist is given to the faithful via altar rails and by method of tincture. So, in order to receive the Eucharist, you have to kneel at the rails located at the front of the sanctuary. Tincture is where the Body is dipped into the Blood before ministered to the faithful. The deacons and altar servers carry a plate and hold it below so as not to spill either species. In general, a lot more words/prayers were said during this Mass. And the postures and gestures were different or rather, more deliberate. Like, you make the sign of the cross, kneel, bow, genuflect more often during the Mass. I noticed that where it’s usually optional for us, they normally do it anyway. Like, it’s just…part of what they do. I’m sure I’m forgetting other little differences…if I remember, I’ll add to the list and make it obvious that I updated. After Mass concluded, I awkwardly waited around for Fr. Chuck to finish catching up with parishioners and he finally heard my confession. We briefly talked and he asked me what I thought about the Mass. I told him that I was impressed by the level of reverence from the congregation–something often desired in Catholic Masses that I’ve been to. Just with all the solemn prayers and gestures/postures, ad orientem-ing, and …just everything… He acknowledged that Msgr. Hart, my pastor back home and his former boss, is aiming to bring about a more reverent Mass experience…slowly, but surely. You can’t just throw mandatory changes all at once. That would be too much of a shock! And yes, I can vouch…SEAS definitely has a more reverent feel to it than it used to, thanks to the slow changes that Msgr. Hart has brought. Anyway, this was a really cool experience–to visit a new church to visit with someone from “back home” and to experience Mass in a different way. I’m grateful for the opportunity! Even if it required me to cancel my flight plans because the whole visit lasted way longer than I originally planned on…but it was worth it. Not even mad. I’d take a Mass and freshly clean soul over catching a flight, haha. Annnnd, I have legit reason to go back and visit…after all, I couldn’t receive the Eucharist …via tincture, for that matter. Our Lady of Walsingham, pray for us! That we be made worthy of the promises of Christ!